Actor Madhur Mittal, center, along with the cast and crew celebrate after the film "Slumdog Millionaire" won best picture of the year during the 81st Academy Awards Sunday, Feb. 22, 2009, in the Hollywood section of Los Angeles. 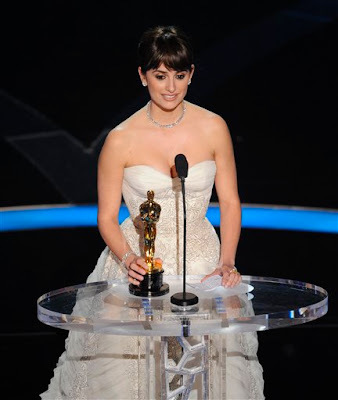 Spanish actress Penelope Cruz accepts the Oscar for best supporting actress for her work in "Vicky Cristina Barcelona" during the 81st Academy Awards Sunday, Feb. 22, 2009, in the Hollywood section of Los Angeles. 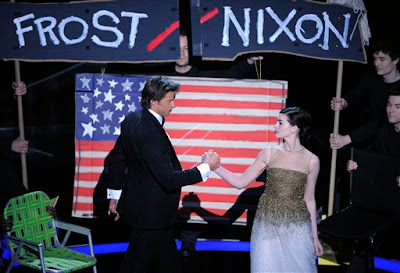 Oscar host Hugh Jackman performs a skit with actress Anne Hathaway during the 81st Academy Awards Sunday, Feb. 22, 2009, in the Hollywood section of Los Angeles. 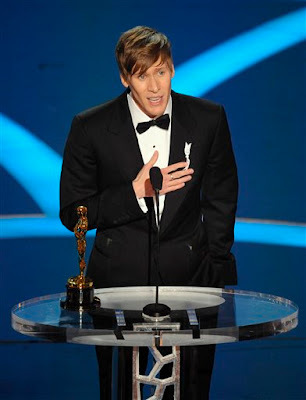 Screenwriter Dustin Lance Black accepts the Oscar for best original screenplay for his work on "Milk" during the 81st Academy Awards Sunday, Feb. 22, 2009, in the Hollywood section of Los Angeles. Greg Cannom accepts the Oscar for achievement in makeup for his work on "The Curious Case of Benjamin Button" accepts the Oscar for achievement in makeup for his work on "The Curious Case of Benjamin Button" during the 81st Academy Awards Sunday, Feb. 22, 2009, in the Hollywood section of Los Angeles. 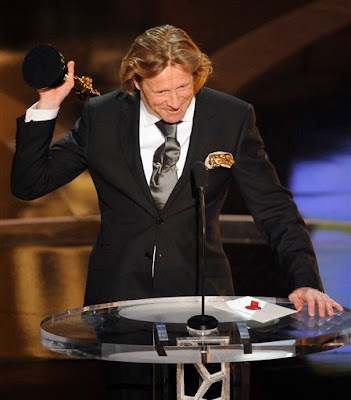 Anthony Dod Mantle accepts the Oscar for achievement in cinematography for his work on "Slumdog Millionaire" during the 81st Academy Awards Sunday, Feb. 22, 2009, in the Hollywood section of Los Angeles. Oscar host Hugh Jackman performs with Beyonce during the 81st Academy Awards Sunday, Feb. 22, 2009, in the Hollywood section of Los Angeles. Comedian Ben Stiller, portraying Joaquin Phoenix, left, and actress Natalie Portman make the award presentation for achievement in cinematography during the 81st Academy Awards Sunday, Feb. 22, 2009, in the Hollywood section of Los Angeles. Oscar host Hugh Jackman opens the 81st Academy Awards Sunday, Feb. 22, 2009, in the Hollywood section of Los Angeles. Sally Bell, mother of Heath Ledger, speaks after his family accepted the Oscar for best supporting actor on his behalf who won for his work in "The Dark Knight" during the 81st Academy Awards Sunday, Feb. 22, 2009, in the Hollywood section of Los Angeles. Looking on are Heath's father, Kim Ledger, left, and sister, Kate Ledger. 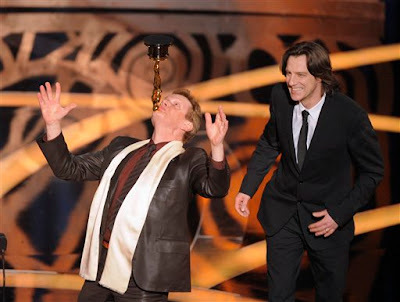 Philippe Petit, the subject of the documentary "Man on Wire," balances an Oscar on his chin as James marsh looks on after the film won for best documentary feature during the 81st Academy Awards Sunday, Feb. 22, 2009, in the Hollywood section of Los Angeles. A.R. 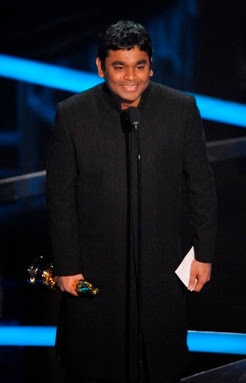 Rahman, left, accepts the Oscar for best original song "Jai Ho" from the motion picture "Slumdog Millionaire" from Alicia Keys during the 81st Academy Awards Sunday, Feb. 22, 2009, in the Hollywood section of Los Angeles. 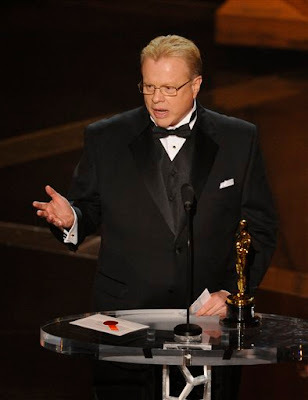 Producer Christian Colson, along with the cast and crew, accept the Oscar after the film "Slumdog Millionaire" won best motion picture of the year during the 81st Academy Awards Sunday, Feb. 22, 2009, in the Hollywood section of Los Angeles. Producer Christian Colson, right, and Anil Kapoor celebrate after the film "Slumdog Millionaire" won best motion picture of the year during the 81st Academy Awards Sunday, Feb. 22, 2009, in the Hollywood section of Los Angeles. Director Danny Boyle, facing camera,right, hugs Freida Pinto as they celebrate after the film "Slumdog Millionaire" won best motion picture of the year during the 81st Academy Awards Sunday, in the Hollywood section of Los Angeles.